On my third trip to New Orleans, I had a small foodie conflict. On one account, I wanted to go to as many new places as possible and not repeat any restaurant other than the obligatory Cafe du Monde. On the other side - we had both of our sets of parents with us, both of whom had never been to NOLA. We had to go to some tourist spots so they could experience the "must go to" in New Orleans. My last two trips to NOLA, I went to Acme Oyster House. On trip one, I loved it and raved about it, to the extent that it was the first place Gabe and I had lunch at during his first visit to the city (my second trip). We were both left so unimpressed that I never wanted to go back. Yet, my parents were told that they "must" go there. We waited in line for over an hour to get in and I pouted like a bratty foodie the entire time. NOTE - if you go to Acme, get a drink to go from a neighboring bar. That is one of the magical wonders of NOLA, even if you have to wait, you can drink on the street, not missing a single moment of fun. Seriously? Have you ever seen an oyster like this in my life? Fresh shucked oysters that were one of the best things I have ever had in my life. I had to put the lemon wedge inside of the oyster to show the true size of it. These oysters were insanely large and delicious. They were not chewy and I probably took down half of them on my own. My Dad ordered a dozen of the charbroiled oysters. The moment he ate one, he ordered a second half dozen as his entree. I prefer the raw oysters to the charbroiled, only because of the butter content. It's a bit too rich for me. I have learned after my last two vacations that I like my oysters raw, plain with a little lemon and cocktail sauce. So different than the girl I was a year ago (when I had to have one cracker per steamed oyster with Tabasco, horseradish, lemon and cocktail sauce - you couldn't even taste the oyster). Dad is still talking about the charbroiled oysters today, nearly two weeks later. This was his favorite dish in NOLA. Are you curious as to what I ordered for my meal? 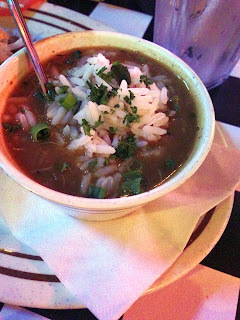 Half Po-Boy & Cup of Gumbo. 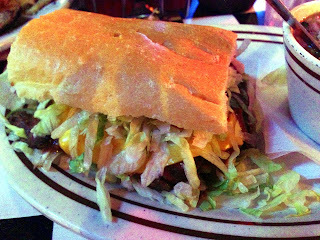 The po-boy I chose was teh Acme "10 Napkin Roast Beef", a traditional slow cooked Chuck Roast served hot & debris style. It was delicious. I finally got my debris style roast beef po-boy. YAY! 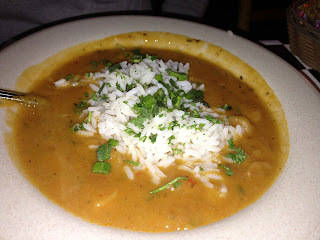 My Mom also ordered the Seafood Etouffee. It was good but she did mention numerous times that it lacked spice and wished she ordered more oysters. This was the only thing we had at Acme that was a little lacking. 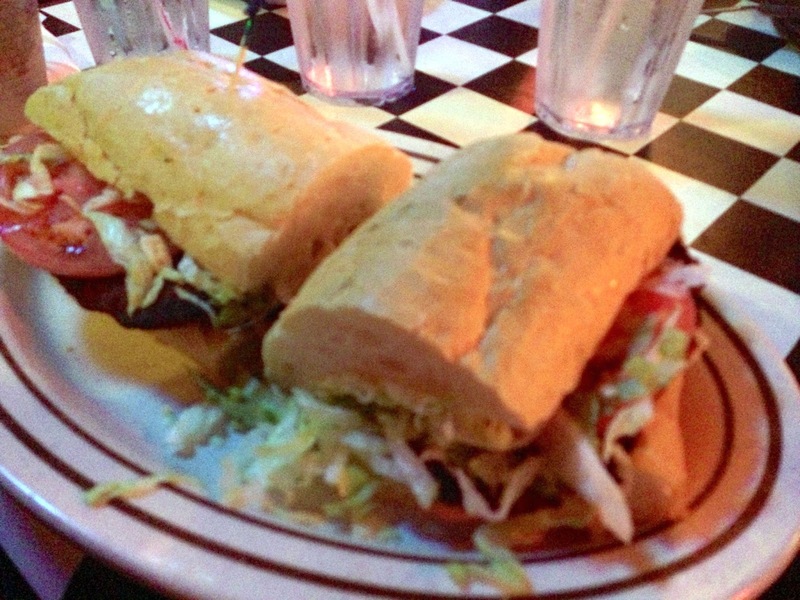 Gabe ordered the Hot Sausage Patty Po-Boy and raved about it all trip. This changed his entire outlook on Acme. I guess his first visit, my second, was truly not a good one and we mistakenly judged it by that one visit. We had such an excellent dining experience this time around. So I change my foodie snob tone I had when I entered the big easy. My head was too big and thought that I was too good for a tourist trap. I sit here and eat my words and am very thankful that Dad's co-workers insisted he came here for a meal. It was one of my top dining experiences in NOLA. Acme is officially back on my must go to list while in the Quarter.